KUWAIT CITY, April 5: Kuwait stocks trod water on Tuesday after retreating in the last three sessions. The price index inched 0.23 pts lower to 5,201.63 points with a mixed board even as investors toed caution in absence of positive cues. The KSX 15 benchmark rose 3.38 pct to 839.98 points trimming the month’s losses to 11 pts while weighted index edged 0.64 pts higher. The volume turnover meanwhile receded further during the session. 123.4 million shares changed hands – a 30.9 pct drop from the day before. The sectors closed mixed. Technology outshone the rest with 2.83 pct gain whereas basic materials slid 2.19 pct, the worst performer of the day. In terms of volume, real estate notched the highest market share of 26.4 percent while oil and gas and financial services trailed with 19.14 pct and 12 pct contributions respectively. Among the day’s movers, National Bank of Kuwait rallied 10 fils to KD 0.650 recouping the losses in the day before while Burgan Bank added 5 fils to settle at KD 0.240. Kuwait Food Co (Americana) slumped 40 fils to KD 2.500 and is trading 500 fils higher year-to-date. Zain rose 5 fils to KD 0.350 on back of over 1 million shares and Wataniya Telecom (Ooredoo) shed 20 fils to settle at KD 1.020. Kuwait Telecommunications Co (VIVA) was unchanged at KD 1.040 and logistics major Agility gave up 5 fils to close at KD 0.465. KIPCO stood pat at KD 0.540 and National Investments Company followed suit. The company has incurred a net loss of KD 5.57 million and losses per share of 7 fils in the year 2015 as against net profit of KD 6.67 mln and earnings per share 8 fils in the same period last year. The market opened flat and slipped briefly in early trade. It ticked up again and moved sideways slipping in red ahead of the mid-session. It troughed at 5,178.3 points amid weak sentiment and managed to claw back almost all the losses at close. Top gainer of the day, Kuwait Cable Vision Co spiked 10.4 pct to 26.5 fils and Yiaco Medical followed with 7.14 pct gain, Al Deera Holding Co slid 7.14 pct, the steepest decliner of the day and Ithmaar Holding topped the with 18.9 million shares. The market spread was slightly skewed toward the losers. 39 stocks advanced whereas 43 closed lower. Of the 125 counters active on Tuesday, 43 closed flat, 2,743 deals worth KD 9.5 million were transacted – a 15.9 pct drop in value from the day before. National Industries Group eased 2 fils to 122 fils while Kuwait Portland Cement held the ground steady at KD 1.020. Boubyan Petrochemical shed 20 fils whereas Ikarus Petroleum Industries Co added 5 fils. Equipment Holding Co clipped 1 fils to settle at 51 fils. Jazeera Airways shed 20 fils with thin trading whereas ALAFCO stood pat at 212 fils. City Group climbed 25 fils to KD 0.480 and Independent Petroleum Group climbed 10 fils to KD 0.320. Humansoft Holding Co gained 20 fils whereas Mezzan Holding Co pulled 20 fils into red. PAPCO was unchanged at 108 fils and United Projects Group followed suit. The company has posted a net profit of KD 6.75 million and earnings per share of 86 fils in the year ending Dec 31, 2015 up from net profit of KD 5.65 million and earnings per share of 72.08 fils in the year before. The BOD has proposed 86 pct cash dividends. Gulf Petroleum Investment Co was unchanged at 39 fils with brisk trading and Kuwait Foundry Company too paused at 188 fils. The company has posted a net loss of KD 2.94 million and losses per share of 19.17 fils in the year ending Dec 31, 2015 after logging a net profit of KD 2.42 mln and earnings per share of 15.76 fils in the year before. The Board of Directors has recommended 10 percent cash dividends. IFA Hotels and Resorts Co climbed 10 fils and Zima Holding eased 1.5 fils after trading 7.3 million shares. Mashaer Holding rose 5 fils to 95 fils and Qurain Petrochemical Industries Co was unchanged at 192 fils. In the banking sector, Gulf Bank climbed 6 fils on back of 2.7 million shares and has retreated 38 fils so far during the year while Commercial Bank was up 5 fils at KD 0.435. 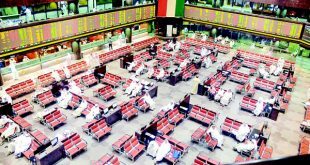 Al Ahli Bank was not traded during the session. Ahli United Bank stood pat at KD 0.435 and Kuwait International Bank dialed down 2 fils. Kuwait Finance House was unchanged at KD 0.475 after trading over 1 million shares whereas Boubyan Bank clipped 5 fils. KAMCO gained 4 fils while KMEFIC and KFIC gave up 1.5 fils each to end at 26 fils and 31 fils respectively. Bayan Investment Co inched 0.5 fils into red and Ekttitab Holding closed 1 fils lower. Sokouk Holding stagnated at 34 fils. National Real Estate Co fell 1 fils to 91 fils and Tamdeen Real Estate Co slipped 10 fils. Mabanee Co and Al Mazaya Holding were flat at KD 0.860 and 104 fils respectively and United Real Estate Co too did not budge from its earlier close. The market has been retreating so far during the week and has dropped 27 pts in last three session. It had added 22 points during whole of March but is down 7.36 pct year-to-date. KSE, with 213 listed companies, is the second largest bourse in the region. In the bourse related news, Tamdeen Investment Co has posted a net profit of KD 11.52 million and earnings per share of 39.07 fils in the year ending Dec 31, 2015, up from net profit of KD 9.05 million and earnings per share of 30.41 fils in the year before. Salhia Real Estate Company has posted an annual net profit of KD 11.62 million and earnings per share of 23.55 fils as compared to net profit of KD 11.42 million and earnings per share of 23.07 fils. The Board of Directors has recommended 20 pct cash dividends. Abyaar Real Estate Development Co has recorded a net loss of KD 21,700 and losses per share of 0.02 fils in 2015 after posting net profit of KD 755,088 and earnings per share of 0.69 fils in the year before. Credit Rating and Collection Co has incurred a net loss of KD 454,911 and losses per share of 2.76 fils in 2015 as against net loss of KD 2.26 million and losses per share of 13.73 fils in the year before. Injazzat Real Estate Development Company has clocked a net profit of KD 3.07 million and earnings per share of 9.2 fils in 2015, rising sharply from net profit of KD 1.51 mln and earnings per share of 4.5 fils in the same period last year. The BOD has recommended 5 pct cash dividends.